This exhibition is the first critical retrospective of the career and work of Janet Darnell Leach (1918–1997). Whilst known as the wife of potter Bernard Leach and as a driving force of the Leach Pottery in St Ives, Janet Leach is acknowledged in her own right as one of the leading potters of the second half of the twentieth century. Fiercely independent, she was a potter with a powerful identity and, combined with an appreciation of sculptural form, brought a unique understanding of clay her work. Born in Texas, USA, she originally trained as a sculptor in New York before taking up ceramics in the late 1940s. 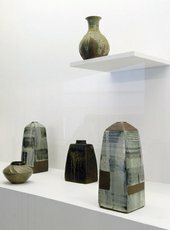 After a subsequent meeting with Bernard Leach and Japanese potter Shoji Hamada who were on tour in the States, Janet Leach lived and worked in Japan before moving to St Ives in 1956. 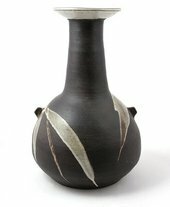 One of the first studio potters from the West to train in Japan, she acquired traditional methods of making and firing. She developed a very direct manner of handling clay, acquiring a particular understanding of the Japanese-Korean technique of coiling and throwing. 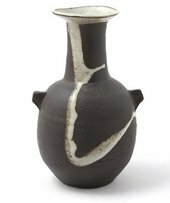 As a great experimenter, Janet Leach went on to devise her own clays, including a red firing body and a dramatic black body, distinctively decorated with slashes of white glaze. Bernard Leach often admired her confidence in being able to handle 'irregular forms and textures', also major characteristics of her work. 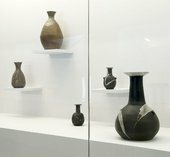 With work dating from the late 1950s to pieces made shortly before her death, the exhibition traces the development of Leach's ideas from the early, more formal pots to the later, freely thrown bottles bearing the marks and scarring of the wood fire; it also includes pots made in Japan. Curated by Emmanuel Cooper and drawn from both national and private collections, this exhibition considers Janet Leach's status as a gifted and original potter making an important contribution to twentieth century ceramics. A new book written by Emmanuel Cooper, published by Ceramic Review, accompanies this exhibition, and is available in the bookshop.